At John Appleyard Dental, we love assisting our littlest patients to achieve and maintain optimal oral health for life. We believe that prevention is always better than treatment, so place utmost care and importance on working with developing teeth and gums. As a result, we’re proud to accept the Medicare Child Dental Benefits Scheme (CDBS), which makes dental treatment more accessible and affordable for millions of families in Australia. Is Your Child Eligible for the CDBS? Please note that services such as cosmetic or orthodontic dentistry, as well as those provided in hospital, are not covered by the CDBS. For additional information regarding eligibility, please call Medicare on 132 011. One of the biggest aims of the CDBS is to encourage children to attend regular dental check-ups, helping them to maintain and improve their oral health and hygiene. 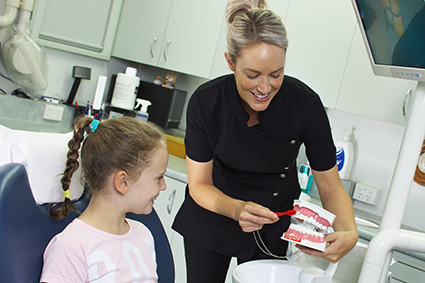 At John Appleyard Dental, our team of friendly dentists are highly experienced in providing children’s dental services and offer two main phases in treatment: prevention and protection. Phase one of a routine dental check-up for children involves an examination, where we assess the child’s complete oral health for any signs of concern. This is then followed by a thorough clean, as well as the application of fissure teeth sealants for additional protection. We may also request x-rays or intra and extra oral photographs, if necessary. Phase two may be required if the child requires additional treatment after their routine check-up, for example, to treat tooth decay with a filling or perform an extraction. To schedule a routine check-up for your child, please call 02 6023 2678 today! For children who aren’t eligible for the CDBS, we can still see them as private patients. Certain dental services may also be covered under your private health insurance.